Is one of the most beautiful National Parks in Bolivia. Is an area apt for paleontologic, archeological and cultural studies and investigations because of its richness in fossils, dinosaur tracks and bones. Within the park exist more than 1000 species of plants as well as a great diversity in fauna. The village of Torotoro is located in a small plain surrounded by mountain ranges of Huayllas and Condor Khaka. 138 kilometres from the city of Cochabamba, Torotoro maintains still its colonial charm and arquitecture. The 25th of July is the towns patrons day in honor to Tata Santiago. The caves are the main attraction of the Torotoro National Park. Eleven of them were investigated by different scientists, however there are 35 more caves existing. The word Umajalanta stand for the water which is drained away in the soil. Umajalanta is located 8 kilometres outside the village. It is one of Bolivias biggest caves, with a dimension of 7 kilometres. To visit this cave is a real adventure, as you have to pass obstacles - wherefore you will need a flashlight, appropriate clothing and boots, a rope, and you should not fear the dark! In its interior there are stalactites and stalagmites, which they gave nicknames dependent on the shape they have, like "Hall of the virgen and the kid", "Hall of the concerts", "Hall of the inspirations" and others. There are also lakes within the cave, inhabited by blind fishes. This cave is perfect for people enjoying adventurous tourism, because within the cave the risks are major and the entrance to the cave is through the water. 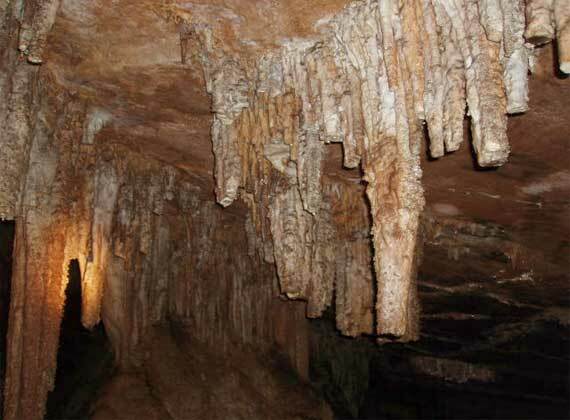 In its interior there are stalactites and stalagmites with suprising beautiful shapes. El Vergel is located three kilometres from the village of Torotoro. 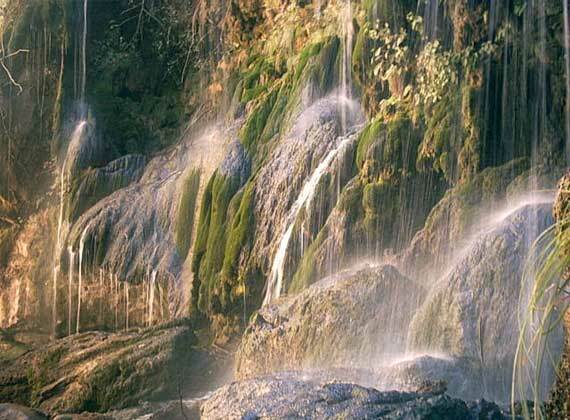 A series waterfall which created a 100 metres deep canyon through water erosion in millions of years. The water falls down from the lateral of the canyon covered by lichen and moos and is forming natural pools of crystal clear water at the bottom of the canyon. Is an area where you could observe cave paintings which reflect the inca culture. The stone house also called "Pachamama Wasi", is a museum which shows creative handcraft made of stones and fossils from the surroundings. Dinosaur tracks can found in the whole plain of Torotoro. It is about petrified dinosaur tracks, means hints of gigantic prehistoric reptiles as the Brontosaurus and Tyrannosaurus, which inhabited this place 150 million years ago. They are found in the edges of the river Torotoro. According to studies, the paintings were a instrument of communication, which were developed by the prehistoric nomadic people. The Garrapatal canyon is an incredible sight, reaching over 400m deep from the lip to the bottom! This canyon is larger than El Vergel canyon and ideal for adventure tourism. Für Information über Touren in den Torotoro Nationalpark, bitte klicke hier.